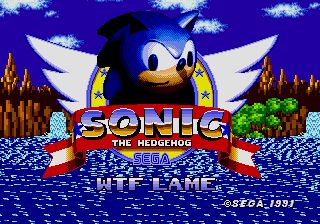 Sonic 1: WTF LAME is a 2009 fan-made joke hack of the original Sonic the Hedgehog game for the Sega Mega Drive. The game plays like the original, but there are special WTF LAME monitors added to each level. 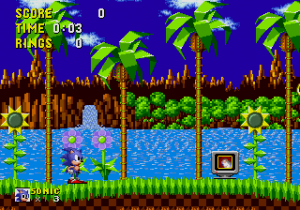 A WTF LAME monitor in Green Hill Zone. Once the scrolling rant has finished, a Game Over screen will appear saying "Sorry...you have just lost The Game. Try again." and the game will reset. It is actually impossible to beat this hack normally, since Sonic will hit a WTF LAME monitor during the ending credits demo. Apart from the new monitors, entering a special stage at the end of a level will also trigger a rant and a Game Over. This page was last edited on 13 April 2018, at 13:33.